It’s traditionally now the start of the Christmas season, which in my household, always includes baking cookies. And usually a lot of them, not matter how many times I say each year I’m not going to make so many. Now I don’t remember who started the tradition of making these particular cookies, but I’m almost certain it was my mother. 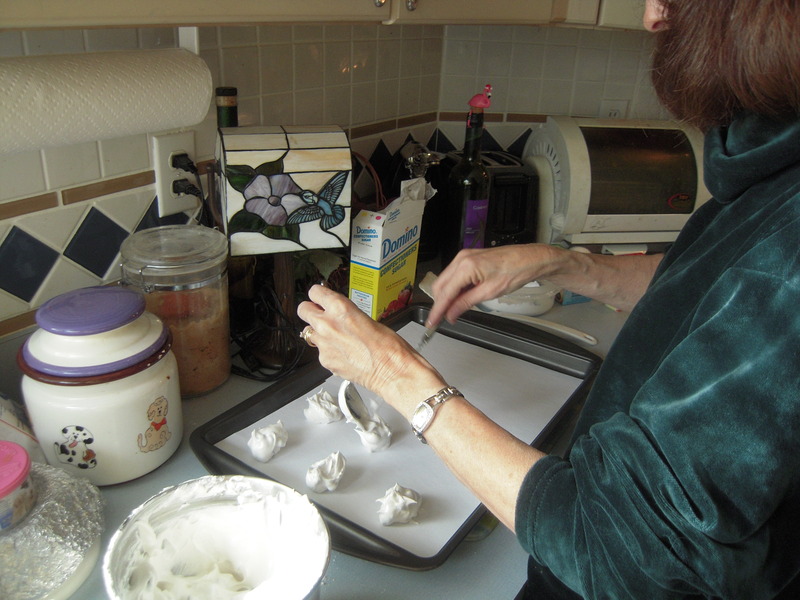 She was always finding the best – and delicious – cookie recipes that we all enjoyed. I always think about her when I’m making these. She always wanted to put walnuts in them, and since I don’t like nuts in my food, I never let her. But you can add a 1/2 cup of them if you want. Just make sure they’re chopped well. Beat ingredients until stiff peaks form, using an electric mixer. I now have a Kitchenaid and it works great! Be sure beaters and mixing bowl are grease-free and room temperature if it’s a metal bowl! Gradually add 3/4 c granulated sugar and continue to beat for about a minute. 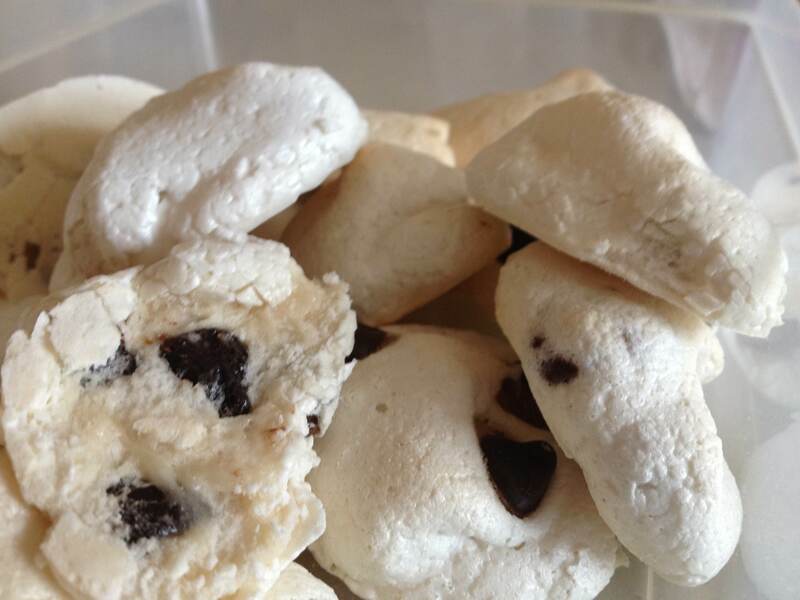 Fold in 6 ounce package of semi-sweet chocolate chips. Regular size works best; not the mini’s. And as much as you’re tempted, don’t add extra! Bake for 25-30 minutes in preheated 300 degree oven, until just slightly browned. 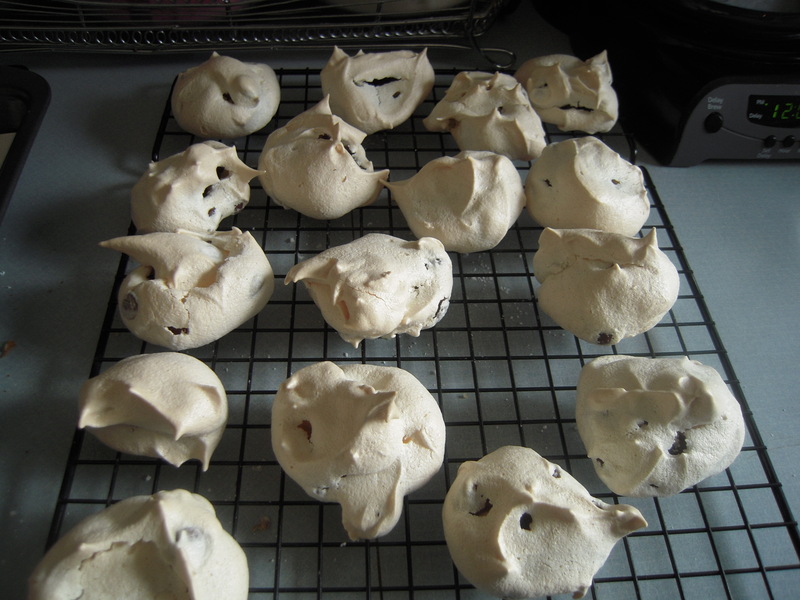 Let rest on sheet about a minute or so until the cookies will lift off easily, and transfer to wire rack to cool. Store in lightly sealed container, but they probably won’t be around long!